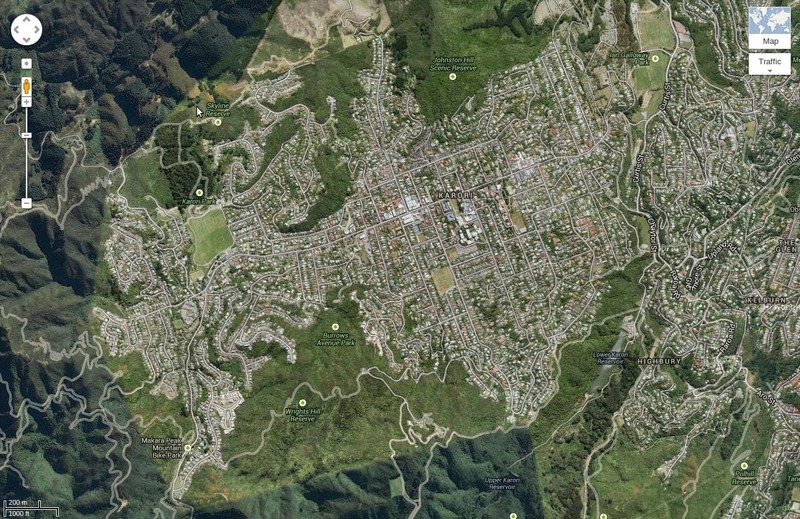 Once in a while, you'll hear Karori being referred to as New Zealand's largest suburb - sometimes the Southern Hemisphere's. Whether or not these trivia are fact is difficult to verify (I wasn't able to just now), even combining the respective powers of google and the internet. So, I'll simply claim it's pretty big. 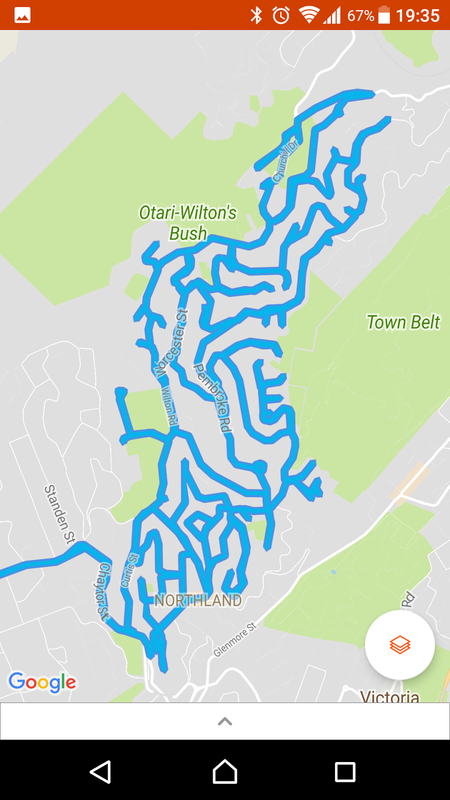 I've lived here for over ten years now, despite growing up in the Eastern suburbs, and regarding Karori as a long way away from anything, and a bit of a hole. There are a couple of ways in at the eastern end, but only one way out in the west. Taking the main route from Karori Tunnel to the top of Makara Road, you'd spend just under 5km driving through Karori. I know for a fact my mood is much better when I'm riding, and I've also observed that I'm much more likely to ride when I've got a plan. And, I'm even happier when the plan's a bit quirky. 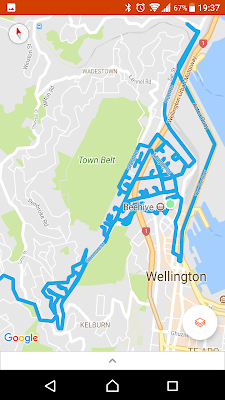 I did wonder a few weeks ago, if someone was to ride every street in Karori, how many kilometres it would add up to? And, how much climbing would there be? It soon became obvious that I'd need to find out. 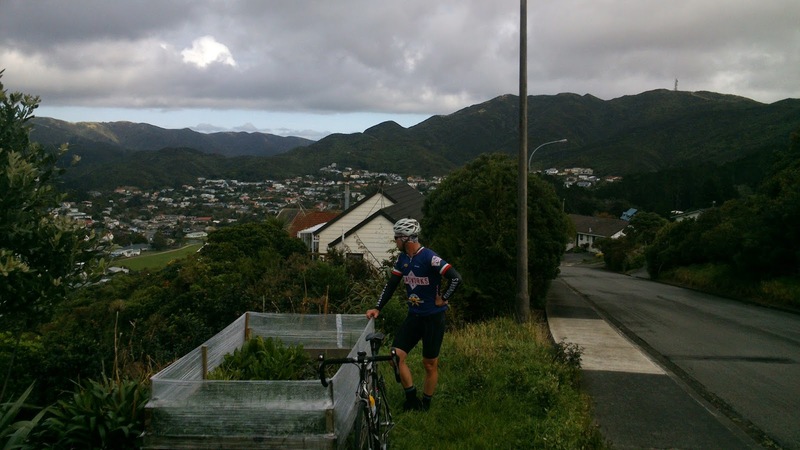 The concept of Everesting also came up this week. While I "like" the idea of notching up 8848vm of climbing in a day, the constraint of doing it by repeating the same climb over and over again, descending the way you went up, over and over again, leaves me a bit cold. Being exposed to that monotonous concept made me think again about variety, and traversing every inch of a suburb would surely supply that. The final key ingredient was the Easter Tour, and for some reason, that gave me the kick up the arse I've desperately needed. As a consequence I've actually ridden my bike quite often over the last couple of weeks. 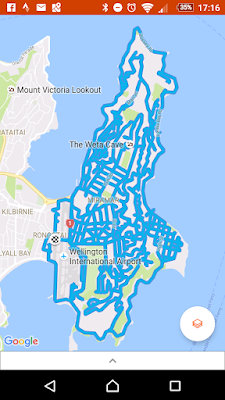 Wednesday Worlds have been supplemented by longer than usual commutes: once via Makara and Johnsonville, and a couple of times on a hilly southern loop, taking in Ohiro Road, Murchison St, Mt Albert and Mt Vic. Starting those rides six months earlier might have seen me in very good shape right about now, but I'll take late over never. 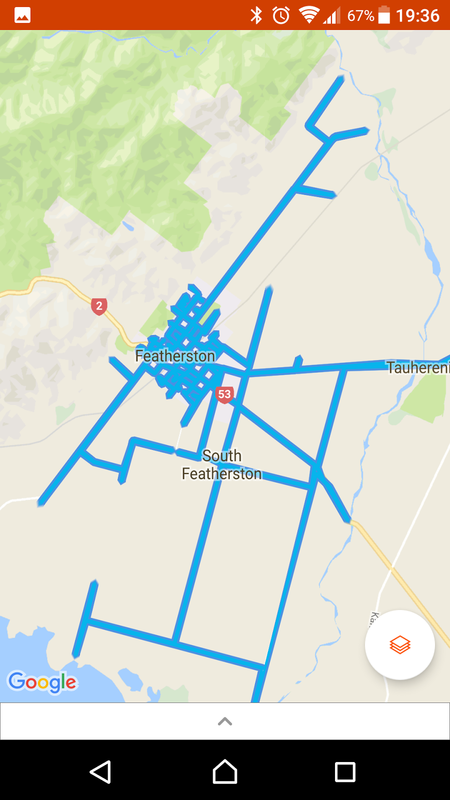 The weather forecast for Saturday was pretty good, and by Friday evening I knew that within 24 hours I'd know exactly how many kilometres I could notch up without leaving Karori, and without too much unnecessary duplication. I asked Simon what he was up to, but he had other plans. I became a little self-conscious about my plan, but when the morning dawned, I flicked a txt to Dave, who happened to be very conveniently located. "I think I'm going to try a ride I've had brewing for a while now. 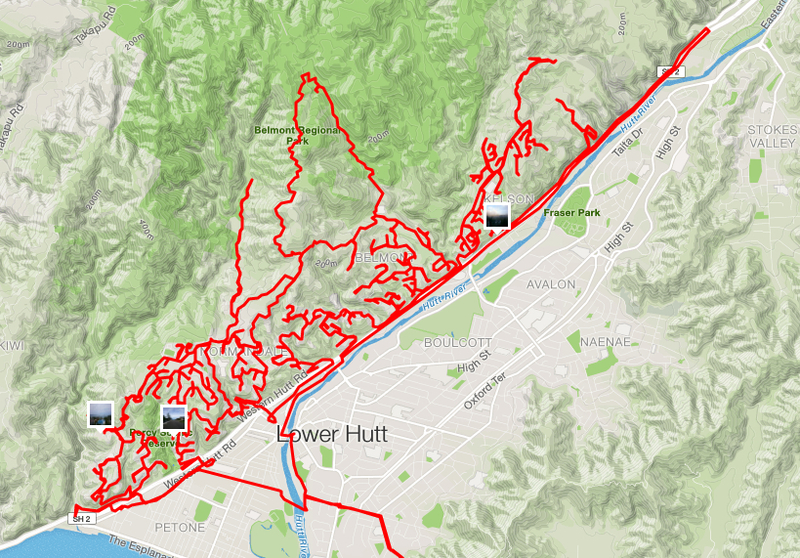 I want to ride every inch of every road in Karori. I'm fascinated to czech its stats." "Mmm sounds like fun :-)"
50 minutes after that, we were rolling out. 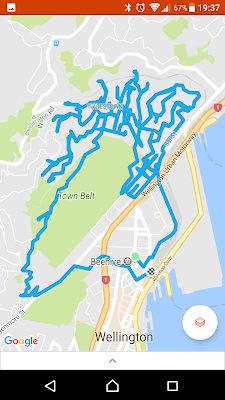 I'd thought a little about the start of the ride, and had realised that with three climbs into Karori, one had to be ridden twice. 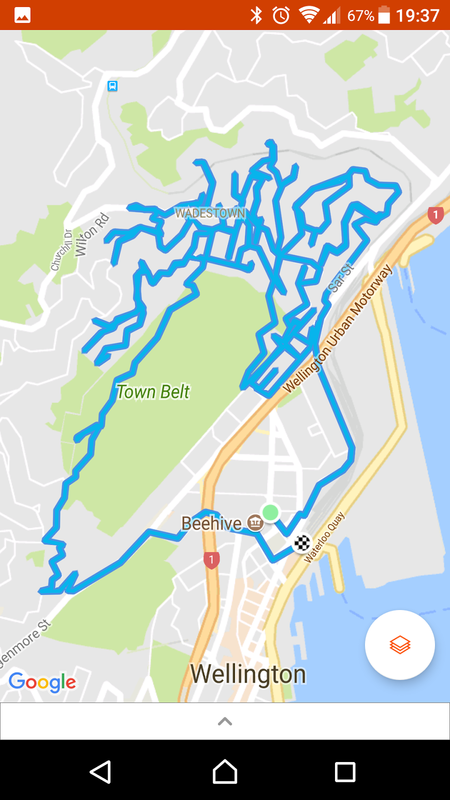 So, I didn't start my GPS until Dave and I were down at the gates of Zealandia, previously named the Karori Wildlife Sanctuary, so surely part of Karori. 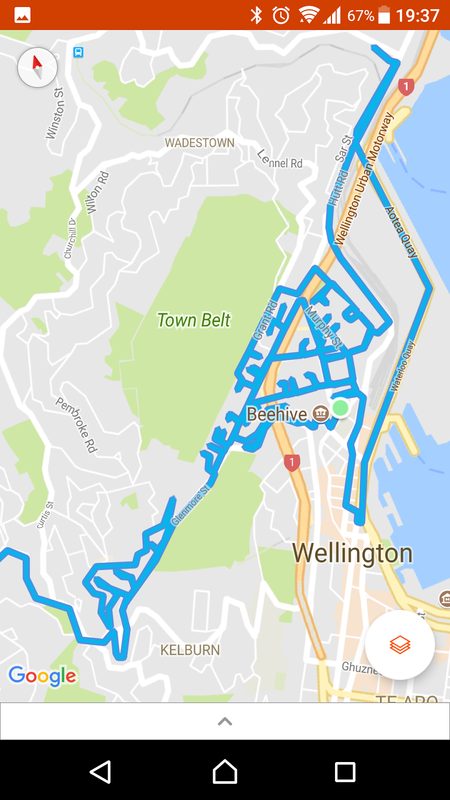 From there we rode up Chaytor Street and onto Karori Road, before making the first left turn onto Beauchamp Street in the village centre. Just up the hill was home, and finishing near home seemed to require starting there too. The curious format of this ride was immediately apparent. We turned right onto Cook Street. 75m later, we swung a U-turn, and were soon back on Beauchamp. Left onto Lewer, U-turn, Beauchamp. Right onto Spiers, U-turn, Beauchamp. Dasent, U-turn, Tisdall, U-turn, Henderson, U-turn...! I've passed these dead-ends multiple times per week in the last six months, but still I'm surprised now at how many there are! We climbed the steep section of Verviers Street past home, and then onto Shotter. We were already in a decent groove, and taking left turns where they presented themselves was instinctive. Later I'd remark how nice it was to be doing such an apparently strange and haphazard ride, without having to communicate each and every turn. 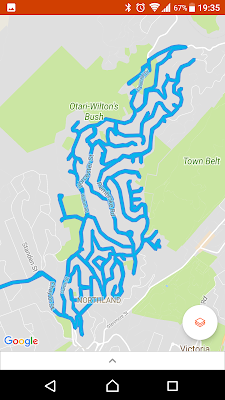 There was a surprising amount of road between us and the main drag again, and I was amazed at how close to Wrights Hill Road we came (on Mewburn Rise). We'd discussed "what defines a road" and while I initially tried to articulate continuous seal, Dave more sensibly suggested roadways with names. It turned out there were very many of those which were glorified driveways, but grabbing them all seemed like just the ticket. Dave's eye for them was proving better than mine, resulting in a couple of early and unscheduled U-turns, as if we needed more. 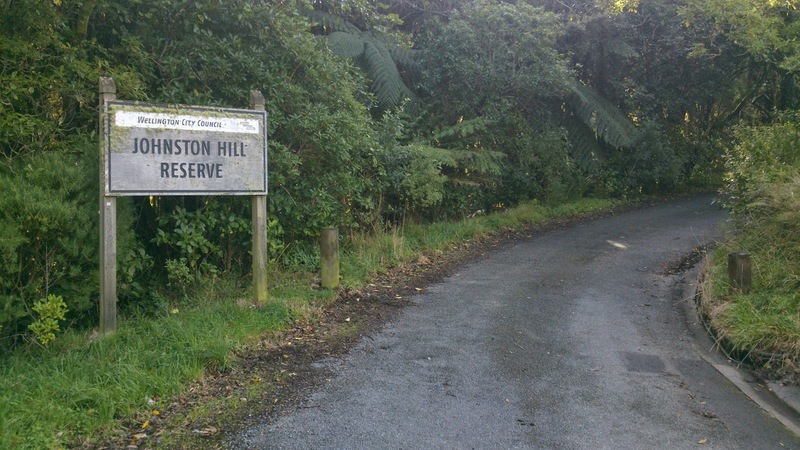 We were soon turning left off the main road onto Burrows Ave, both mentally noting we'd have to come back to grab a bit of Karori Road we'd skipped on our loop through the hills. I'd been to the end of Blakey Ave once, but hadn't noticed Beatty disappearing up the hill, and it surprised me. Back on Burrows, we saw Jim, and stopped for a natter. It was fun to explain what we were up to. In turn, he told us about the Kei car is his driveway - a small sports car that looked like everything was at about 75% scale. 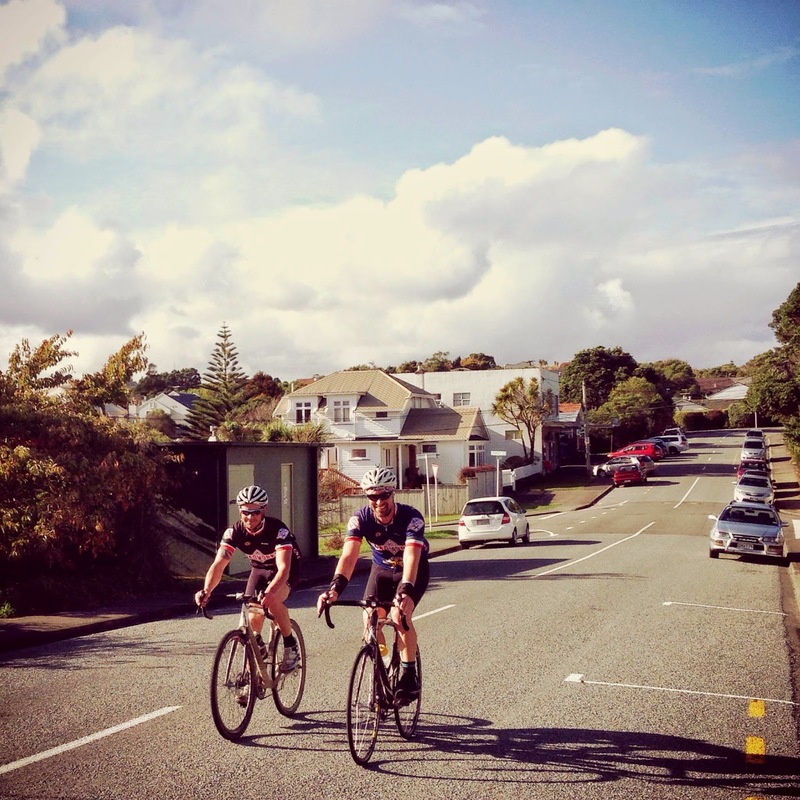 We were sure to ride all of Richmond down to Karori Road, before turning around to hook into Collier. One of virtues of doing this on bikes was that we were able to jump onto the kerb to double-back, rather than making a somewhat peculiar and potentially dangerous manoeuvre in the middle of the intersection. Progress seemed slow, but very pleasant. On account of the fiddliness of the route, we were mostly going quite slowly, and as a result, we were able to chat almost constantly. Middle of nowhere? 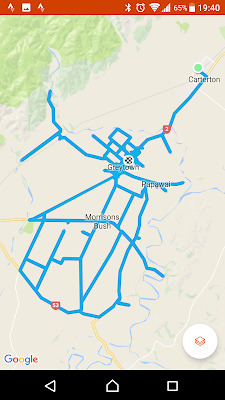 AKA, 4km from the Karori shops. We'd both dressed for rain, and while it was chilly, there'd been no precipitation and it was a nice spot for a short stop to reorganise clothing (and to take a photo or two). We made the left into Allington Road, and having visited the ends of Hathaway (complete with its impressive driveway-to-nowhere) and St Albans, we were soon at the top of Allington itself. 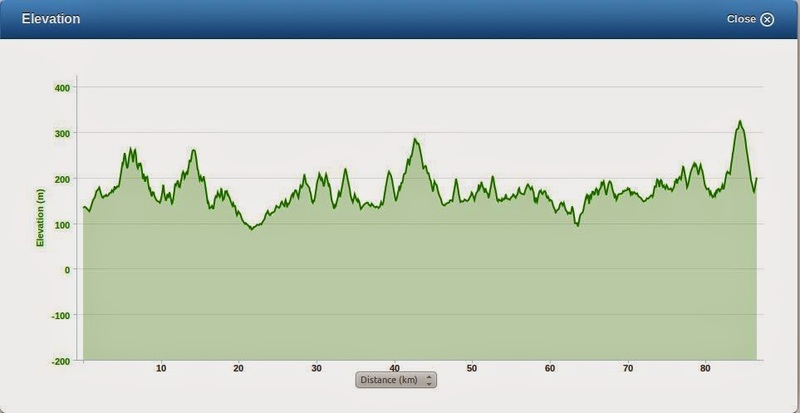 We were just under 30km to this point, but I was surprised to see only 800m of climbing. It had felt like more. I was also surprised to see that the South Karori Road-end was lower than the Karori Tunnel (87m vs 132m asl). The highlight of our excursion up Thurleigh Grove was observing a man borrowing his neighbour's hose. The funny thing was they lived across the road from one another...! 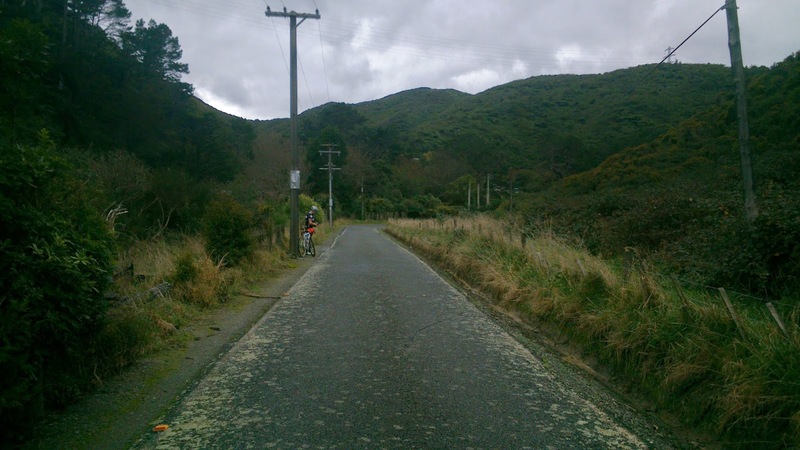 From there it was up to the top of Makara Road, and on to the northern slopes. 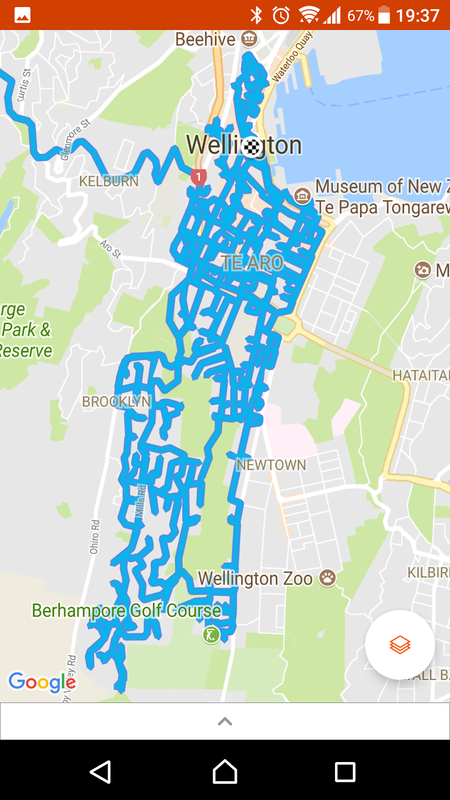 We thought to gather up some of the Karori Road sections we'd missed earlier, and a bit of a communication breakdown saw us discover Natalie Way. Score. Percy Dyett Drive and Montgomery Avenue weren't as hard to climb as I was expecting, and it was interesting to sense yet another change in the vintage of the houses we were passing. And to imagine where the roads were extended into the hills - minor roads at the bottom becoming major roads further up, where space wasn't at quite so much of a premium, and the planners future-proofing things somewhat. We passed a couple of vege patches on the side of the road and had good views back over some of what we'd already seen at close quarters. We were unaccosted in our tiki-tour of the Futuna Close estate, and did wonder whether the houses were only sold to members of the church? 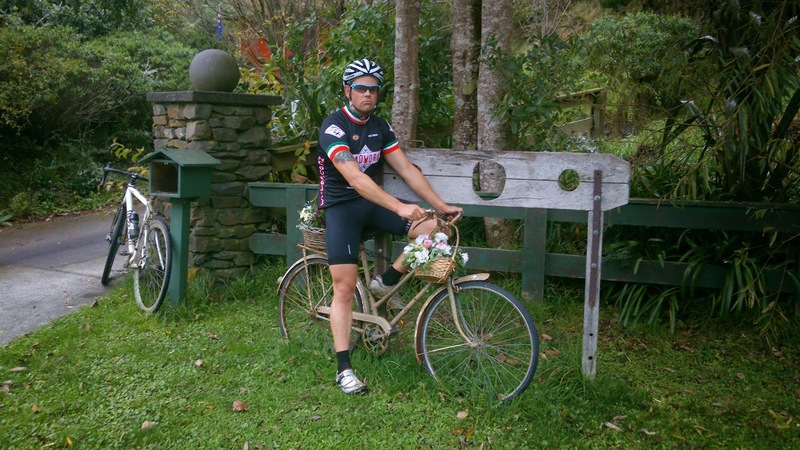 Dave and a bus driver outdid each other for politeness on Karori Road when we were grabbing Newcombe Crescent. 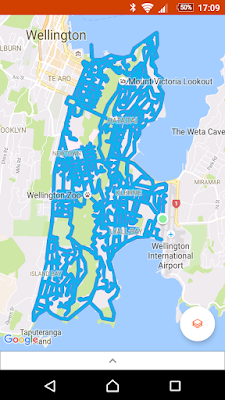 While I was very pleasantly surprised at how my legs were holding up, we both quite happily concluded that the driveway into Johnston Hill Reserve was not a road. There certainly wasn't a street sign there, and we gave it a miss. I was fascinated to discover the road loop connecting Hatton St and Homewood Crescent, to add to the various other finds along the way. 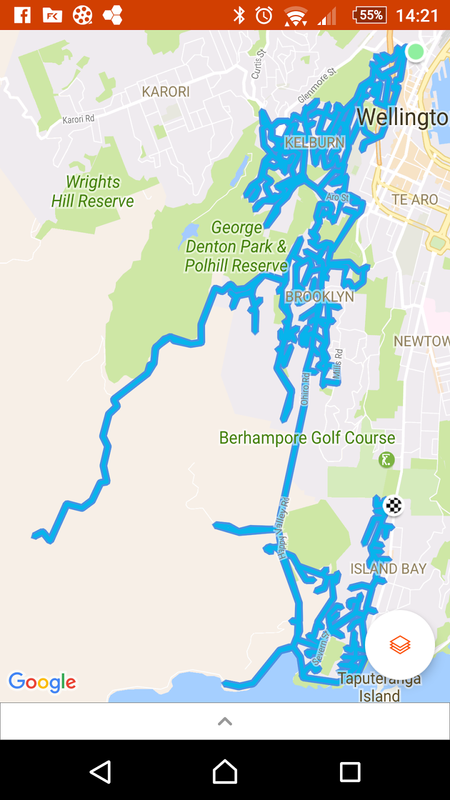 I'd probably have done an anticlockwise loop of Seaforth Tce had I been on my own (or in front, or had the chance to give Dave my sales pitch), but clockwise was perfectly suitable, even with the short climb on Old Karori Road back to the intersection. 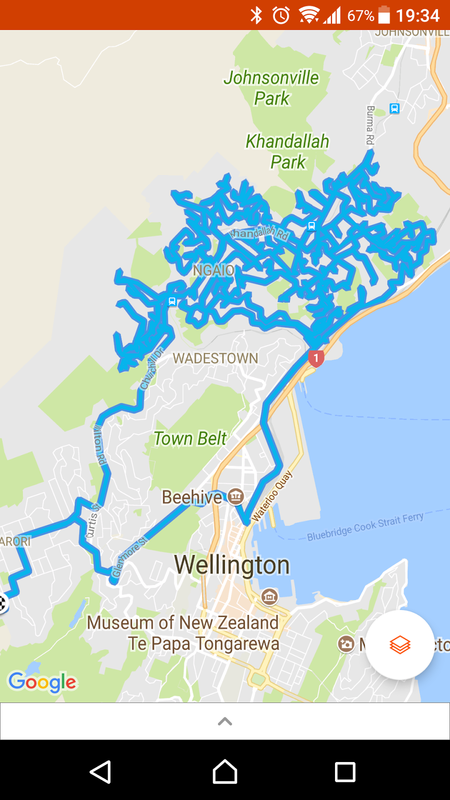 We were both surprised to see that Old Karori Road actually becomes Whitehead Rd for a few dozen metres, only to pick it up again on the right along Curtis St. We guessed the original route went through what is now a bush-clad path. It was very nice to ride straight past Creswick Terrace. "Northland" we agreed. 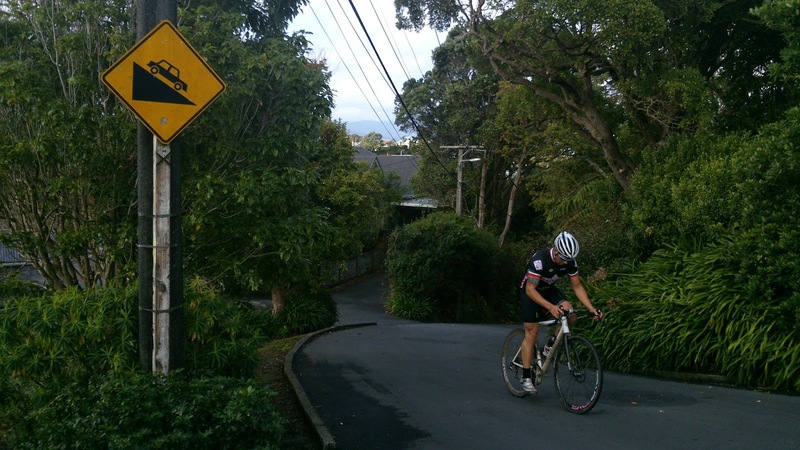 Climbing Birdwood Street really felt like we were on the home stretch, though it was into the most tricky quarter of the suburb navigationally. 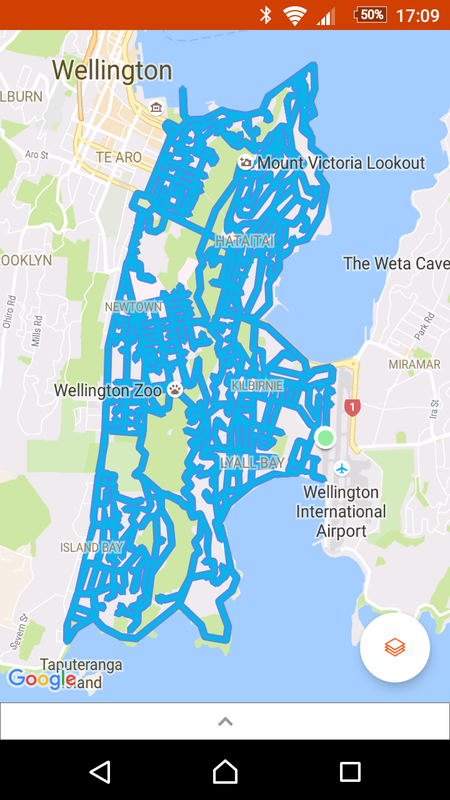 There were quite a few blocks - luckily an uncommon feature elsewhere. We did the best we could, finding the odd gem hidden away, including this street sign 50m from the end of Joll St. I was very glad neither of my tyres let go at the bottom - a damp bit of road covered in rotting leaves. We clocked up 69km at the gates of Marsden College, which I'd never seen before, and immediately afterwards caught up to local legend Brent Backhouse at the end of what looked to have been a hard ride! We saw him a couple more times as we ducked in and out of the various streets in the vicinity. Thanks to Backy for the photo! We'd been fairly disciplined to this point about grabbing things pretty much like a clock hand wipes the clock face clean. But, the structure of things had made that easy to do. 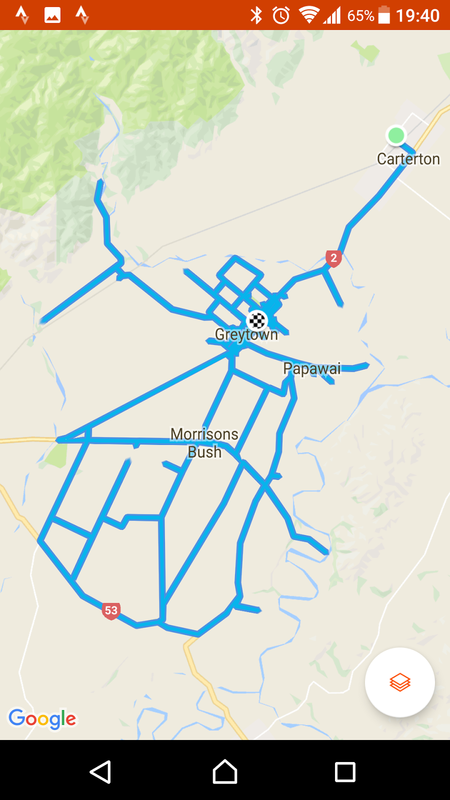 Here, we deviated from that strategy and went as far towards home as Campbell Street, working our way back towards Messines Road. I was surprised at the extent of Donald Street, and wondered why it had been left as a deadend. We climbed Duthie St up to Messines, before finally looping back past Clive's old place to grab the south-eastern extreme of the suburb. Leaving only Wrights Hill Road. For the last couple of hours we'd been mindful of it, often questioning why on earth we'd not done it first. 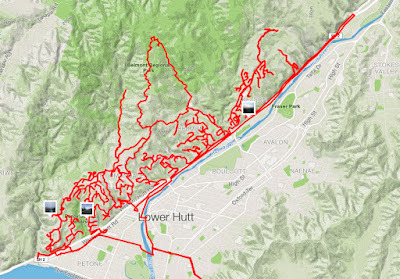 Both sets of legs were starting to wane, and the thought of the longest and steepest climb in the suburb wasn't the nicest thing in the world. We broke the bottom half up by grabbing Voltaire, but nothing could really shelter us from the steep pinches in the top half. Soon though, they were done, and we allowed ourselves a short stop at the end of the to admire the view. There were a pair of Harleys parked there, and it did strike me that motors were a pretty sensible bit of technology. ... and in the vertical plane too! For the record, we rode 86.57km, and 2558vm from the sanctuary gate back to home, all within the suburb of Karori, and a height envelope of 92m to 323m above sea level. We knocked that out in just over four and a half hours, about four of which we were happily chatting away. Fun times...! A kooky ride, but one I have contemplated myself. 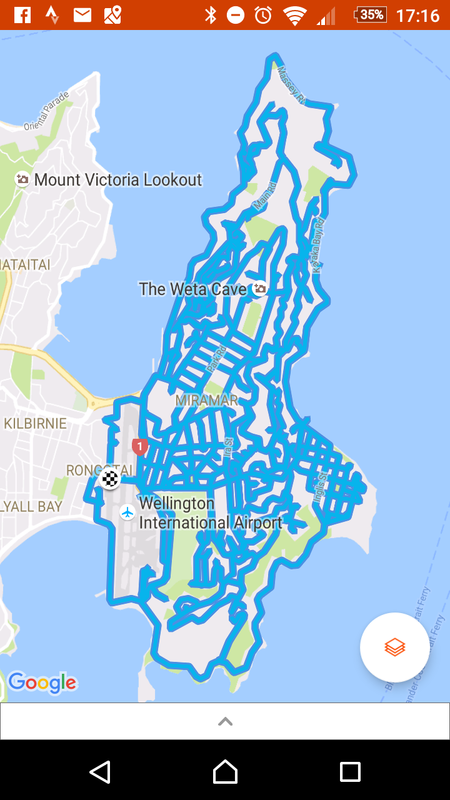 Might have to give Island Bay a go in a similar vein when I have a spare day and some legs that work. 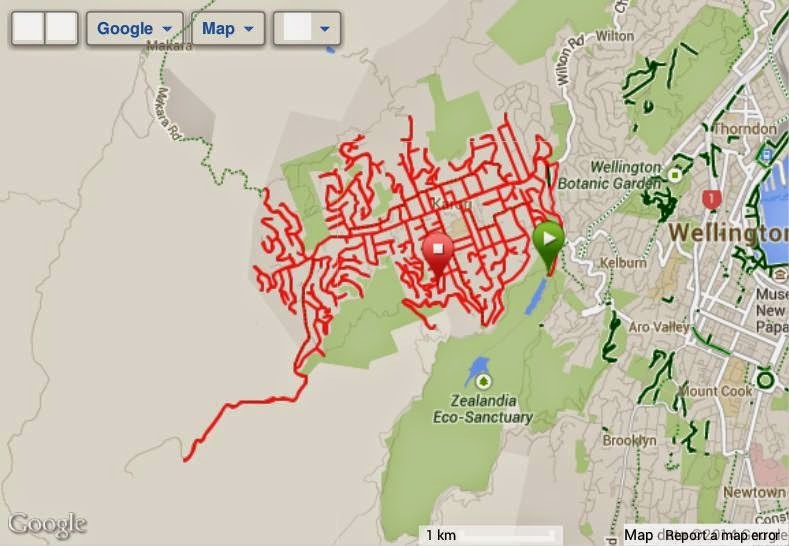 Nice one John - really interesting ride! I wouldn't have guessed the distance at anywhere near that much. Excellent, ! I had often contemplated doing that!, I'm surprised at the distance, would have thought a lot less than that. Slightly weird adventures are the best.